Stun Master has been manufacturing stun guns for over 25 years. They are one of the most trusted and reliable stun guns on the market today and are non-Lethal. All Stun Master stun guns come with a Lifetime Warranty! 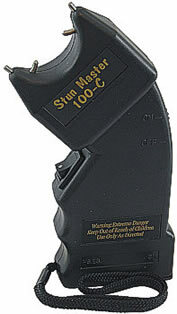 The Stun Master 100,000 Volt Stun Gun only is 5" tall. The wrist strap ensures that you won't drop the stun gun when you need it the most. Check out our great discount prices above. Holsters and batteries are also on sale below. This Stun Master 100,000 Volt Stun Gun can be delivered in 3 to 5 business days. If you would like to receive your order sooner, guaranteed 3 day, 2 day and next day delivery options are available upon checkout. Orders placed by 2:00 PM central time ship the day they are placed. If you have any questions or concerns call our customer support staff at 800.960.2015 or click the live chat button on the right side of this page. Our courteous and professional customer support team is always glad to help!